Jim McIntyre is a Certified Hatha Yoga Instructor who has been practicing yoga since 2002. “My own yoga path began with a typical focus on the physical aspects of stretching and breathing. I had knee damage from decades of running and squash, and hoped that yoga could help. When I took my first yoga classes, I was lucky enough to be encouraged to see what I could do, rather than what I couldn't. As an instructor, I maintain a healthy respect for the importance of that first step in the yoga journey and the fostering of positive encouragement for all subsequent steps. 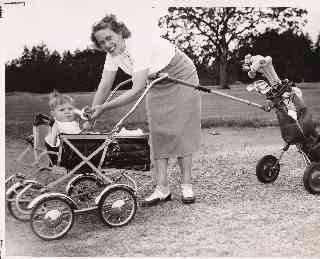 I have been around golf most of my life since the day my dad hooked up a baby carriage to my mom's golf cart so she could get back on the course. The picture on the right was taken by the local newspaper in 1953 just after she won the ladies' amateur city championship. The bananas helped maintain quiet when she was on the green. Doing yoga for golfers allows me to combine hatha yoga with some dowel yoga techniques to create an enjoyable practice that is suitable for a diverse audience." at 2186 Oak Bay Ave.
improve our concentration, memory and general disposition. We come to a class environment to share the energy of determination and effort. If you have an open mind and try your best, you contribute as much to the class as anyone else, and you benefit equally as well. It is a personal journey and everyone is respected for the steps they take on their unique path. If you would like to read more, see the Yoga for Active Older Adults article by Karen Scully. Golfers everywhere are slipping off their spikes and taking up their stances on their mats to learn the benefits both on and off the course, of adding yoga to their fitness regime. When we break down the golf swing into it's component muscular and posture features, we discover that developing strength and flexibility in these areas, also benefits most of the activities we pursue in daily living. Adding yoga mind calming and focusing techniques is beneficial in and of itself. It also allows us to shift our focus to the right side of the brain where visualization and muscle memory resides. The brain and circulation within the brain can benefit from learning to relax our thoughts. If you’re new to golf, you’re going to learn posture fundamentals and build strength and flexibility that will help you learn the game with less risk of injury. If you’re new to yoga, this is yoga for any age, size or level of experience. The goal of this yoga class is to work on all of the areas of the body used in golf, and as a result, maximize the enjoyment of the game. Yoga is more than just stretches. It is the union of mind and body, which means we learn to relax the mind to relax our muscles. In turn, we learn to tone our bodies and increase flexibility in order to calm our thoughts and moods. We get to enjoy these benefits when we leave our mats, and apply them wherever we wish, both on and off the course.